As deadline for nuclear agreement looms, President Obama admits a "big gap" remains between Iran the six world powers. U.S. President Barack Obama admitted on Sunday that a "big gap" remained between Iran and the six world powers, as held high-level talks were held in Oman on a nuclear deal, reports AFP. Secretary of State John Kerry met Iran's Foreign Minister, Mohammad Javad Zarif, in Oman, with the November 24 deadline to turn an interim agreement into a long-term settlement looming. Obama, however, warned it may not be possible. "Are we going to be able to close this final gap so that (Iran) can re-enter the international community, sanctions can be slowly reduced and we have verifiable, lock-tight assurances that they can't develop a nuclear weapon?" 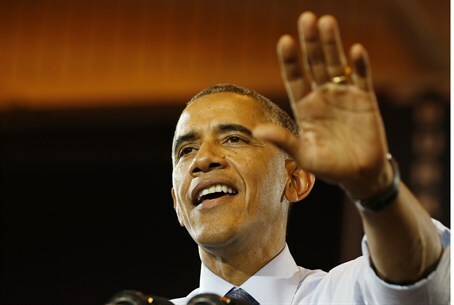 Obama said, speaking to CBS News in an interview broadcast Sunday. "There's still a big gap. We may not be able to get there," he admitted. Kerry and Zarif met for three hours in Muscat with former EU foreign policy chief Catherine Ashton, the lead negotiator in the talks, also present. Both sides then broke for lunch and separate private discussions with aides. No statements were made before the main talks resumed, noted AFP. Despite assurances it is confident of reaching a deal on November 24, Iran, has been toughening its stance in recent weeks. The country’s deputy foreign minister, Abbas Araqchi, recently said he sees no prospect for a deal unless the other side abandons its “illogical excessive demands”. A senior Iranian official followed those comments by declaring that Iran will demand that all Western sanctions be lifted as part of a final deal, rejecting an American proposal of a gradual lifting of sanctions. On the plane to Muscat on Saturday, Zarif told reporters Iran and the six world powers, also known as the P5+1, have concentrated on "solutions rather than differences" since talks on the sidelines of the UN General Assembly in New York in September. After Sunday's meeting between Kerry and Zarif, the political directors of the P5+1 powers will hold talks in Muscat on Tuesday. The main negotiations then move back to Vienna on November 18 for a final push towards the deadline six days later.